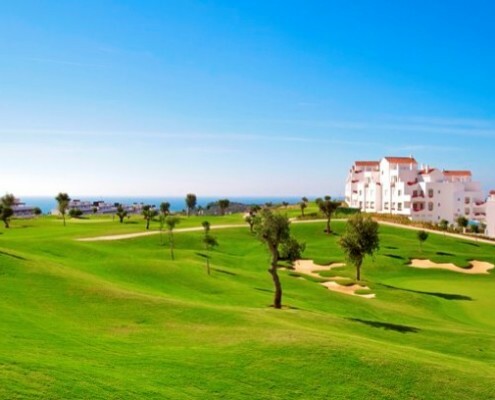 Valle Romano Golf Course, in Estepona , is an exceptional 18-hole course, prepared to host the most demanding and prestigious tournaments. Its design guarantees the enjoyment of the amateur players and becomes a challenging route for professionals. A course that is designed so that perhaps one day it will be a legend. The golf course of Estepona occupies about 60 hectares of green, has 5 km of route and has been constructed following the highest quality standards of the United States Golf Association of America, with Agrostis grass variety “Tifsport”, certified by the University of Georgia, and with an irrigation system with the latest technology. 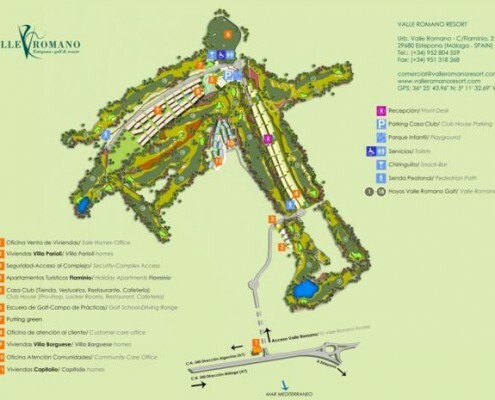 With an average of 5 tees per hole, and spacious greens with multiple flag positions and looking out to sea, Valle Romano is a course to enjoy in every way. It also has the Club House equipped with all shop , restaurant , club room , locker rooms with sauna and a golf school , and floodlit driving range where learning is a pleasure. The Academy of Valle Romano Golf offers lessons in improvement, initiation and also classes for children. The programs are adapted to the needs of every amateur, whether beginner or advanced, with the application of the latest teaching techniques in the world of golf. The school offers intensive courses of one week, Specific courses of putting and short game, VIP courses, Clinic or private lessons. In Valle Romano they take care of every detail and pamper the golfer to the fullest. The player receives a warm welcome upon arrival. At the end of their game, the marshall team offers to clean golf clubs and shoes as a courtesy of the house.